Top ten of the year for sure. If I happen to see ten new films better than this film, then 2011 will be quite the amazing year to say the least. This film is a beautiful visual poem slowly meditating on the purpose of existence and the way we live our lives and how each moment really is a miracle no matter how minuscule. I imagine everyone will take away something different from this film, with the "plot" being relatively straightforward and really only a loose skeleton for larger ideas people are free/forced to put the images together and come up with your own theory on the film. 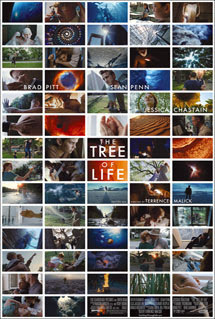 I am going to discuss my reaction to the film and what I saw as Malick took me on a journey from the beginning of the universe through dinosaur times to the 50s to the present. The plot revolves around Sean Penn's character remembering his brother passing away, and remembering his childhood growing up in 1950s Texas. Both of these experiences cause him to question the nature of existence and creation. Well...that's how I saw it. 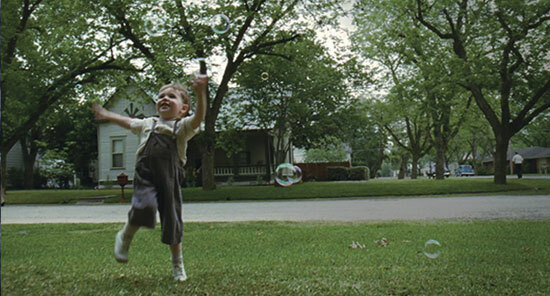 Malick's films are never easy and always require the viewer to stay directly engaged in order to comprehend what they are watching. This is perhaps his most obtuse to date, even taking the soul searching in The Thin Red Line to new heights. As sparse as his dialogue usually is here it is almost non existent. The film moves from one beautiful image to the next telling most of the story without words, the narrator also changes voices throughout the film. So it really is up to the viewer to decide what they are watching. Like I said I think we spend the film in Sean Penn's mind, I think the times we hear his mother or father narrate are still Sean Penn's memories taking voice as his parents. I'm positive you will have a different take on what it all "means" and that's half of why this movie is so amazing. 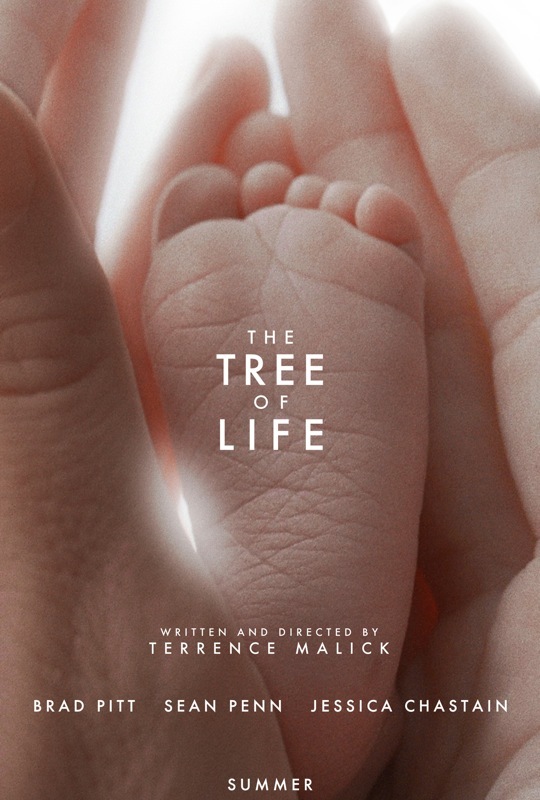 Lots of movies allow for open interpretation but this film forces you to bring your own emotions and own views on existence and creation and what the "point" of it all is. There are no answers here just more questions and more thoughts, as Malick seems to ask what is it YOU believe? Why do you think we're here? what's really important? There are two main points that I took from the film. The first is in direct relation to the cinematography. You already know its gorgeous, but Lubezki really outdoes himself. He is always amazing and has a habit of working with directors that give him a chance to stretch his visual prowess, from Burton, to Cuaron, to the Coens, to Malick. He shows us our world for all of its beauty, and drives home the idea that whether it is the creation of the universe, the bonding of the first atoms together, the dinosaurs roaming around the open plains, or walking through fields as a young boy, or living in a big city, existence is beautiful. Every moment is a miracle and through the beauty of Lubezki's cinematography we feel just how miraculous every part of life is. Birth, death, parents, first love, dreams...we see it all captured on film and portrayed here through a simple family. This film does this over and over again...it presents a universal theme...and then boils it down to such an intimate level that you can't help but be enraptured by the power of this film. The second point I took from the film is that existence is hard. Simple idea? Yah of course and we see it over and over in books and films but here they show us that hard doesn't mean being sad or poor...but that work is necessary to get by, because in the end you have to look out for yourself and your own. We see Brad Pitt's character struggle with the intense love he has for his sons...only able to show how much he cares by trying to teach them the ways of life so they can their own men. We see dinosaurs kicked while their down, and violent eruptions of nature. We see Sean Penn, in all of his success lonely and empty as he seems to have pushed his family away after a hard childhood. Everything needs work, effort, and determination. As beautiful as existence is, you need to work for it. Brad Pitt's talks about his dreams of being a musician, but he gave that all up to have a family, and by the end of the film he is able to tell his son "you are the only thing I ever made...you're all I ever want to make." Life is not always what you expect it to be, but sometimes it's exactly what you need. This is a film that I could go on and on about, but I won't. I feel this film is destined to be in an installment of Movie Night, maybe paired with Wild Strawberries. I could sit here and talk more about the "plot" about what it says about the polarity between Mother and Father, about its discussion of youth, and Nature vs. Grace. Again...I won't. You need to go out and see this film and forge your own thoughts on it. Then find your best friend and show them the film and talk about it for hours and hours. So if you're lucky enough to have this play near you and are willing to take a different kind of cinematic adventure then this is the film for you. Beware, there is no traditional narrative, and long stretches of ambiguous seemingly illogical imagery. Malick...great job. You might have made a film better than Badlands....MIGHT...I'm going to have revisit that one. Definitely his most experimental, and to see someone as talented and established as Malick continue to push his own aesthetic is refreshing. Take notes Spielberg. One last thought - so how about that last scene?....we are all of the people we see and meet? we are a collection of memories and experiences that add up to a human being? The ocean is pretty?